Proudly growing in Maryland, USA, Baywater Farms is a small farm with large service. Proudly growing in Maryland, USA, Baywater Farms is a small farm with large service. We’d like to welcome you to our beautiful new website and our brand new blog. Come and learn about our rich history, what we grow, and how we grow it. Are you interested in working with us? Find out how. If you are looking for even more information, please don’t hesitate to contact us. Baywater Farms is family-owned and operated, and dedicated to serving communities and regions such as Baltimore, Washington, D.C., the state of Maryland, the beaches of Delaware, and the Eastern Shore as well. Whatever expectations your produce distributors may have, we can exceed those expectations. We’ll also work with your restaurant, your CSA, and your wholesale produce supplier. We strive to balance the character and charm of a small farm with the capacity of a much larger one. Want to work with us? You’re in luck! We’re highly experienced, committed to ethical principles, local, and easy to reach. Trust us to provide you with the freshest and best heirloom produce that you can find. Here at Baywater Farms, we aim to grow the freshest local heirloom produce in the most responsible way possible. Part of how we do that is with hydroponics. Our hydroponic greenhouse covers ½ an acre. That might seem tiny, but inside you will find enough field crops to cover 24 acres worth of land, not to mention the fields around the crops themselves. The hydroponic greens that we produce are renowned for how delicious they are, and best of all, they’re available all year long, no matter what the weather might be. Two of our most popular field crops are graffiti eggplants and shishito peppers. We cultivate both of these crops with the greatest of care to ensure that they’re loaded with flavor and will brighten up your plates as much as possible. Out of the Past and Into the Future: Our farm has existed for six generations, and over all that time, we’ve remained on the same land until today. What do we owe our success, and our existence to, you might ask? The passion, care, and duty of the farmers who sowed our first seeds. 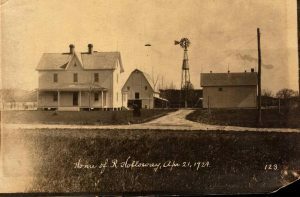 Ephraim Holloway started his farming operation in 1860, in Salisbury. But it was his son, Sylvester, who oversaw construction of the first farmhouse. This farmhouse allowed him to start raising and attending to the first crops and farm animals that belonged to our property and our family. But even though everything has to come to an end, that doesn’t mean it can’t lead to a new beginning. Like a wise old king who knows his time is near, Sylvester split up the farm before his death. One of his hardest working sons, Randolph, wished to follow in his footsteps. So Randolph proceeded to take control of the farm and buy two more parcels of land from his siblings. Randolph’s son Frank was his successor, but Frank didn’t start farming until after coming home from World War II. After Frank’s time, our farm fell on some hard times, and it wasn’t until Robert Holloway saved the family farm by making a deal with his grandmother to preserve both the farmhouse and the land around it that we started to make a comeback. In the 1990s, Robert planted 2 ½ acres of some of the sweetest blackberries you’ll ever sample. Since then, our business has thrived thanks to shrewd business decisions and refusing to compromise our principles on growing the freshest local heirloom produce. We now have over 1,000 acres, and in 2011, we founded Baywater Greens to manage the production of local hydroponic lettuce, which then led to the other crops that delight so many consumers these days. We Revived the Maryland Fish Pepper: Have you ever tried a Maryland fish pepper? They’re a tasty result from another long and fruitful Maryland summer. We’ve been searching for the right historical crops to revive, and the Maryland fish pepper is the big winner. Traditionally, fish peppers were used to kick the taste of seafood dishes on the Eastern Shore up a notch. Over time, however, these peppers fell into obscurity and near-extinction. But thanks to the legacy left behind by our ancestors, we know how to keep our crops ethical and more importantly, sustainable enough to satisfy the next six generations of Marylanders. We realize that we aren’t the focus – our crops are. To that end, we sow all of our seeds by hand, taking care of them every single day of the year, and only harvest them once they’ve reached their optimal ripeness or freshness. They’re all delicious, nutritious, non-GMO, and responsibly grown, so won’t you try some? Wholesale/Distributors: We’ll deliver what you need when you need it. Whether you’re a national distributor or a local one, we’ll work with you to get our produce to as many consumers as we can. Retail: Our produce is available at several farmers markets all along the Eastern Shore. Find out which ones, and learn more about our retail sales via Facebook. We’d love to meet you and make your acquaintance, so if you see one of our farmers, don’t worry about stopping to say hello! Restaurants: The concept of farm to table may be trendy, but we’re here to prove that it’s more than just a fad. We’ll get our crops to your restaurant in a matter of hours, so you won’t have to worry about waiting for days or weeks just to get them. CSA: While we don’t currently host our own Community Support Agriculture program, we will supply CSA providers with our most popular items. We can also handle orders for custom grows in the quantities that you need, right when you want them. Want the Freshest, Best-Tasting Produce? Contact Us Today! This entry was posted on Friday, September 29th, 2017 at 1:23 pm. Both comments and pings are currently closed.